Region: This Caterpillar can be found in most parts of the United States, with the exception of the Far North. Similar species are found throughout North America. Life cycle: This insect produces one to six generations each year. The adult moth will migrate south for the winter. Physical Description: This 1 3/4 inch long caterpillar varies in color from tan to green to brown with a black head and yellow stripes down the back. It is identified by a V-shaped white mark on its head and is somewhat hairy. It can be seen hanging from threads or curled up in leaves. The adult moth is gray; the females have a pinkish or white wing margin, and a wingspan of about 1 1/2 inches. The eggs are covered with hair and are laid in groups ranging from 50 to 150 on the host plants. This caterpillar is similar to the Army Cutworm and the Beet Armyworm. Feeding characteristics: This pest attacks bean, beet, cabbage, corn, cucumber, potato, spinach, sweet potato, tomato, turnip, and other vegetables. The larvae feed on corn and grasses in the early spring and later chew on the stems of host plants near the ground. These caterpillars feed at night. 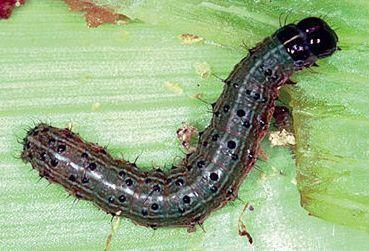 Controls: This caterpillar is an occasional pest and can be controlled by handpicking when the problem is small. The Trichogramma Wasp, Tachinid Flies, Spined Soldier Beetle and a beneficial Parasitic Nematodes - Neoaplectana can help control this insect. If vast numbers are present, use Bacillus thuringiensis or dust with sabadilla to help control the caterpillars.